marquee lights in honor of the performer, Joan Rivers. It was not until the public campaigned for her honor including celebrities such as Cyndi Lauper, Harvey Fierstein and Donna Murphy, that Broadway executives decided to reverse their initial decision to not dim the lights as tribute to the legendary actress. 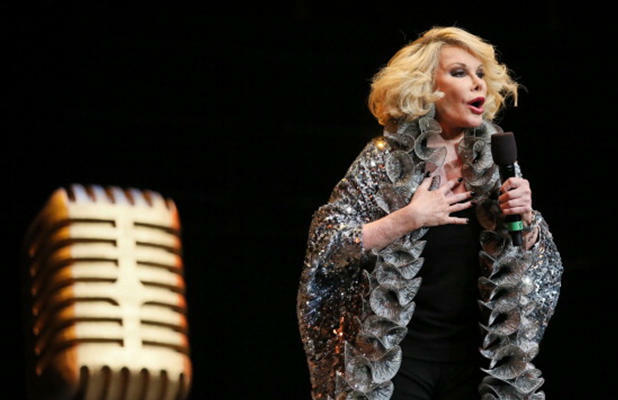 The league committee had concluded that Joan Rivers was not an active enough member of Broadway and just did not meet the criteria, although she performed, supported, and wrote for the theater, and was a nominee for best actress in 1994 for the Tony awards. After Broadway’s initial decision, questions concerning the tradition of the dimming lights arose, such as, what is the history behind this long standing ritual, and what is the criteria expected to be met in order to receive this ultimate recognition? The simultaneous dimming of the Broadway marquees is a tribute to professionals that have achieved their place in theatre history. This serves as one of the most timeless and elegant traditions that the New York theatre holds. This is a custom so honorable and prestigious that it is a shocker that no one knows how it got started. According to Charlotte St. Martin, the executive director of the Broadway league, this ritual has been going on for about 100 years. This ceremony takes place after the first show night after the passing of the artist. As soon as curtain time strikes, all the lights of the Broadway theaters are shut off unannounced, creating a moment of silence in commemoration of the performer. While the criteria needed to determine who the lights will dim for remains confidential, we do know that anyone who has been active with the theater is eligible. This includes the actors, directors, playwrights, composers, producers and designers. The Broadway lights have been dimmed for actors Robin Williams, Elizabeth Taylor, Sir Donald Sinden, Lena Horne, and many more. The tradition of the dimming of the Broadway marquees is a great way to commemorate those that have brought art into our lives, and they will never be forgotten.